This ring will remind you to stay focused on those aspects that help us lead joyous, loving, courageous lives. Let the strength of these words move deep into your heart. Know that the Universe is there to support you – all you need is to have the courage to act, the faith to believe, the love for yourself and everyone around you, and the trust to know that everything is as it should be. 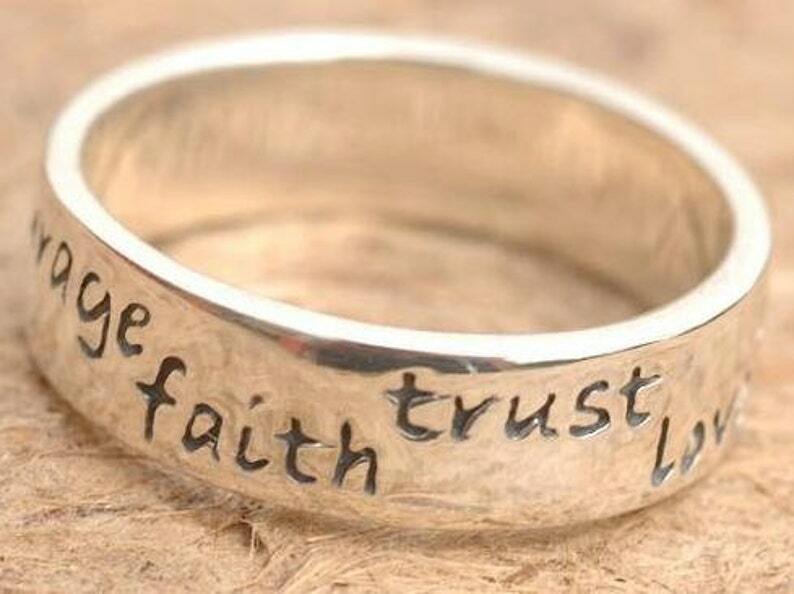 The courage, faith, trust, love ring is perfect to help you stay grounded. The energy in this ring is absolutely palpable. The phrase is repeated around the entire surface of the ring, so there are always 2 to 3 words visible – know that the universe will show the right words when you need them. This sterling silver ring is 5.5 mm wide (.22 inches) and 1.5mm thick (.06 inches). It is also available in 14K, 18K or 22K gold (if the listing is not in my store and you want it in gold, please send me a message). Please note that we do have some sizes in stock. If your size is not in stock it will be a minimum of 15 business days before the item is ready to ship. All our jewelry is made locally in NYC, USA with recycled silver.